on three separate setups which leading to reduce the production rate and increasing cycle time with cost as well. 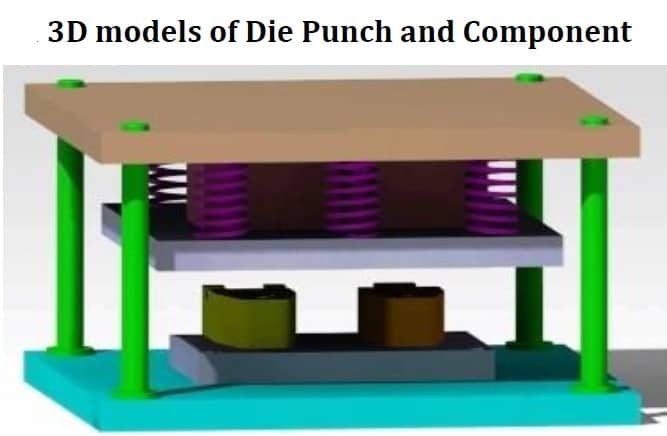 The theoretical calculations were done for calculating cutting force, tonnage required, Von-Mises stresses, fatigue life, buckling load and total deformation. The 3D parts are modeled in CATIA-v5 and saved in .stp file format so that it can be imported from any of the analysis software. As per the companies requirement cad drawings are drawn in AUTOCAD software. The various analyses like Von-Mises stress analysis, fatigue life, are carried out on Ansys 14.0 workbench analysis software and results are compared with theoretical results. The results are within 5% of allowable limit. cycle time of operations is approximately 4 minutes. After the implementation of this project we can expect this to 30 secs.